"Open Hand, Open Heart, Open Mind" 32' x 17' x 6" Medium: Steel and perforated steel. 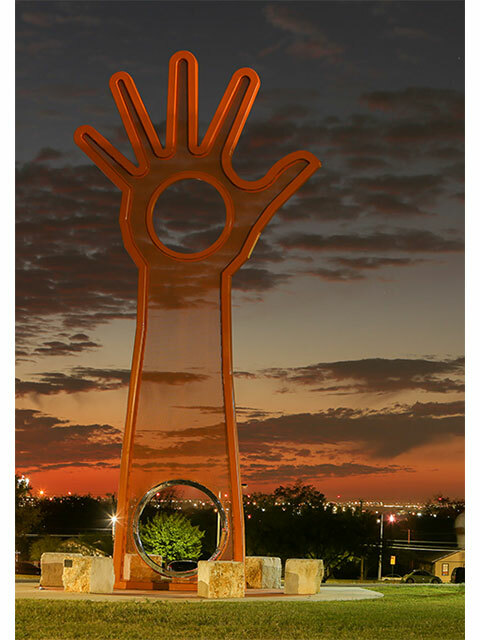 The steel sculpture, depicting an open hand at the top of an upraised arm, is 32 feet high, seventeen feet across from pinky to thumb and 6” deep. The areas that appear transparent are sections of perforated steel plate. The ring at the bottom of the sculpture is hand-polished stainless steel. Dr. Martin Luther King and his philosophy of social change inspired the artwork by non-violent action. The open hand depicts a gesture of non-violence and is reinforced by the open ring in the palm further depicting a non-aggressive pose. The ring at the bottom of the arm is designed to encourage visitors to step through the artwork. The silky smooth, polished stainless steel ring is meant to be touched. In doing so, as one steps through, ones hand is open and mimicking the open hand of the sculpture. This action symbolically connects the visitor to the sculpture and the non-violent philosophy of Dr. King.